'Bacteria. Friend or Foe?' 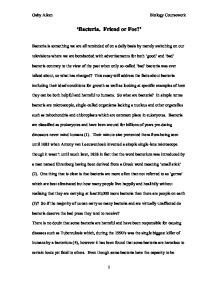 Bacteria is something we are all reminded of on a daily basis by merely switching on our televisions where we are bombarded with advertisements for both 'good' and 'bad' bacteria contrary to the view of the past when only so-called 'bad' bacteria was ever talked about, so what has changed? 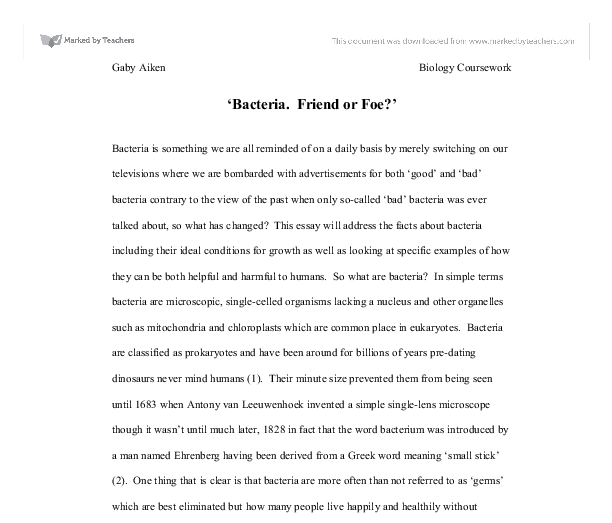 This essay will address the facts about bacteria including their ideal conditions for growth as well as looking at specific examples of how they can be both helpful and harmful to humans. So what are bacteria? In simple terms bacteria are microscopic, single-celled organisms lacking a nucleus and other organelles such as mitochondria and chloroplasts which are common place in eukaryotes. Bacteria are classified as prokaryotes and have been around for billions of years pre-dating dinosaurs never mind humans (1). Their minute size prevented them from being seen until 1683 when Antony van Leeuwenhoek invented a simple single-lens microscope though it wasn't until much later, 1828 in fact that the word bacterium was introduced by a man named Ehrenberg having been derived from a Greek word meaning 'small stick' (2). One thing that is clear is that bacteria are more often than not referred to as 'germs' which are best eliminated but how many people live happily and healthily without realising that they are carrying at least10,000 more bacteria than there are people on earth (3)? ...read more. Bacteria have many talents which have enabled them to inhabit our sometimes inhospitable planet for much longer than any other organism not least of which is the almost unbelievable rate at which they can reproduce. Like every other living organism there are ideal conditions under which they perform best and as far as multiplication is concerned they require a nutrient supply, an energy source, water, a suitable temperature and pH level which is individual to each species, as well as oxygen, though some do grow better without it and are known as anaerobic as opposed to aerobic bacteria. Pneumonia caused by Streptococcus pneumoniae is an example of an illness caused by anaerobic bacteria where the bacteria inflame and infect the lungs and the bronchial tubes (6). Although aerobic bacteria are most commonly know for their ability to break down waste they too can cause infections, for example of the soft tissues by the bacteria Staphylococcus aureus. Where conditions are favourable a single bacterium is capable of splitting into two every twenty minutes resulting in between 500 million and 1000 million bacteria being produced after only twelve minutes (7). This is surely a frightening statistic in the context of disease but from another view point, that of scientists culturing 'friendly' bacteria it is of major use especially in the field of probiotic drinks. ...read more. it is hardly surprising that the average household is filled with bleaches and antibacterial agents as parents try to keep their children safe from illness. As we have seen bacteria can cause body odour, caries, strep throat and bubonic plague to name just a few from both ends of the spectrum however, they also have a lot of good characteristics which makes them more of a friend than a foe as far as humans are concerned. In short without bacteria we could not survive as we would have no way of digesting our food or producing vitamins nor would we be able to break down the worlds waste so we would in effect being living in the midst of a rubbish dump. Many of our foods such a yogurts, cheese and wine are all made from bacteria so without them our recipes would all be rather dull. The medical profession would be without antibiotics and the health conscience among us without probiotics. Their ability to live almost anywhere in the world is unrivalled and despite the best efforts of some to wipe them out they are here to stay. More diverse than mammals or insects they will continue to make a substantial amount of the world's biomass without which humans would not exist. ...read more. The agar plate containing E-coli bacteria and Streptomycin antibiotic. Looking at this plate I can tell that the antibiotic did have an effect on the e-coli bacteria as I can clearly see the zone of inhibition but in addition A lot of bacterial growth too. This tells me that I can help heal an infection or disease containing the E-coli bacteria I would know to use a streptomycin antibiotic. For example, under some circumstances, insects can develop continually - for example the larval stage surviving underground in the winter, and then moulting in the summer into the final adult form (e.g. Blister beetles). Many insects survive unsuitable periods as pupae (e.g. in the ooze in the bottom of swamps, bogs, or other wetlands. Still others are resistant to radiation. Bacteria are truly remarkable in terms of their adaptations to extreme environments and their abilities to survive and thrive in parts of earth that are inhospitable to other forms of life. Many strains of B.sub are used in the commercial production of extra cellular enzymes. Other strains produce insect toxins, peptide antibiotics and antifungals. Some of these have been used in agricultural crop production. E.coli is a gram-negative bacterium, as the diagram relevant to gram staining on the previous page proved.